If you are the child of the 80s and if you can hum Doordarshan’s signature tune and recall the colours of the montage; if you remember the Ek chidiya song and sing it too (to probably your kids now! ); if you can recall the yellow saree of the Maggi mummy and Lalita ji of Surf fame then you most definitely remember the Buland Bharat ki Buland Tasveer. Yes! Hamara Bajaj. Bajaj Chetak, the two-wheeler that was a defining characteristic of our childhood and an imminent part of our teen years. Many of us have fond memories of riding the scooter to markets and may be to tuitions. Unfortunately, out of production for a while and not a frequent sight on the Indian roads the sight of the beloved two-wheeler on the set of Comedy Nights with Kapil Sharma on Colors TV brought back the nostalgia and got me thinking. Buland Bharat ki Buland Tasveer, Hamara Bajaj. When a Bajaj arrived at home, the neighbourhood would celebrate its arrival! A symbol of the growing India, we all have memories of the humble scooter; our tribute to this glorious symbol of the Indian automotive history. I have very clear memories of roaming about the town on the grey Bajaj Chetak that my father owned. The grey scooter was recently sold off but I can still recall the ‘vrooooommmmm’ sound of the scooter as ‘Papa’ put it in gear to take my mother to the school where she taught. When we were kids the same sound in the evenings signalled Papa’s homecoming. We would rush out of doors to see what treats he had for us in the basket of the scooter. As we moved out of the house for further studies the same sound came to signal a particular hour on the clock as we lay there in the bed lounging during the holidays and our parents made way to their respective workplaces. My daughter, when she was three, was taken on her first scooter ride and since that time she insists on taking round of the town on the scooter, standing in front, letting the air blow her hair in all directions. The incomparable thrill of a scooter ride! Bajaj has been a household name in India for about 75 years. Bajaj Auto, the company that produced the two-wheeler that came to be associated with dreams and prosperity in the 80s, started out in the year 1945 as Bachraj Trading Corporation Private Limited. ‘Chetak’ was the first scooter model to come out of the factories in 1972. It remained a star throughout the decade of its launch and hogged much limelight in the 80s as well after the launch of two other models, Super and M-50. Chetak, got its name after the brave horse of legendary warrior from Mewar, Maharana Pratap. 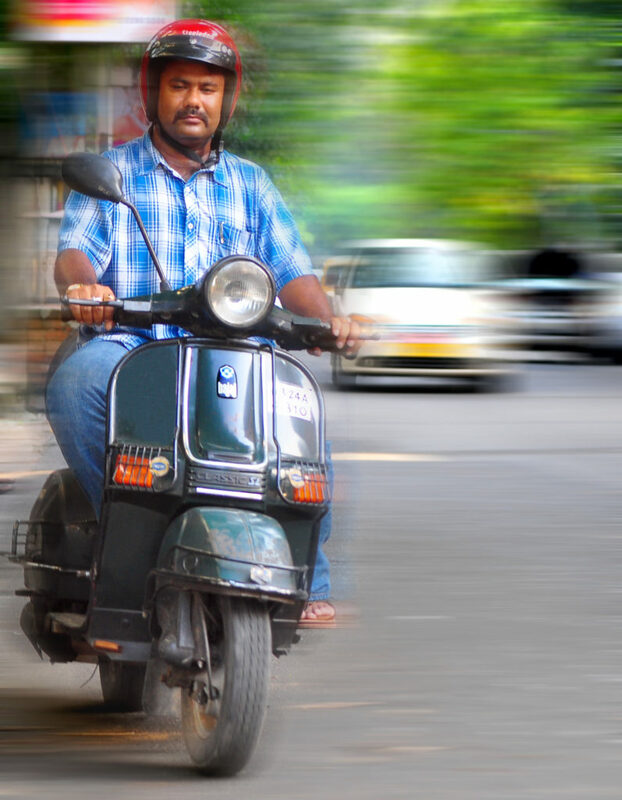 Messers Bachraj started out by selling the imported Vespa, a product of Piaggio, an Italian company. It was in 1959 that the company obtained a license from Government of India to manufacture two and three wheelers. The year 1960 was of marked importance as the company went public. Under the license from Piaggio, Bajaj launched Vespa 150, in the same year. In 1971 the company started to manufacture the three-wheeler good carrier. Chetak was next on the list of production. The reliable and economically priced scooter fulfilled the desire in many households to own a vehicle. Rahul Kumar Bajaj was the force behind the Chetak scooter. At one point of time, the scooter had a ten-year waiting period. Rahul Bajaj, in the capacity of the Managing Director of Bajaj Auto in 1972, invested a lot of time and money in the research and development of the scooter that went on to garner a place for itself in the auto history of the country. The 4-stroke Chetak remained a flagship model until late 80s & the Hamara Bajaj television commercial ensured that it held on to that spot of glory. The monopoly that Bajaj enjoyed at a certain point time in the two-wheeler segment soon began to see competition from the likes of Honda and Vespa, which came out with products that challenged the beloved scooter directly. The license agreement with Vespa had ended by 1977 and Bajaj launched the ‘Super’. Revered as a dowry item, the Super was quite identical to the Vespa. A three gear scooter Bajaj Priya was also launched in 1977. Do you remember the good old AMBASSADOR? And soon after the days when we could spot a Bajaj on the road become a rarity, however, the one thing that remained was the fact that Bajaj was now a glorious part of our history. A lot of us drove the vehicle and many more enjoyed a ride on it. It was an icon of prosperous India and was seen everywhere from garages to weddings and Bollywood to narrow Indian roads. Till date, my heart warms up when I think of the times when the arrival of a Bajaj at home was no less than a celebration, a scooter that everyone in the neighbourhood dropped by to take a look at. A popular tagline for Bajaj was ‘You just can’t beat a Bajaj’. And I for one couldn’t help but agree more.